We are a trusted name in the industry for manufacturing and supplying Vegetable Cutting Machine. The offered machine is regarded for being impeccable in terms of strength and highly durable. It is used for chopping vegetables and is provided with a wide range of blades for making it suitable for a wide gamut of Vegetable Cutting applications. This machine is operated on electricity and is resistant to corrosion. 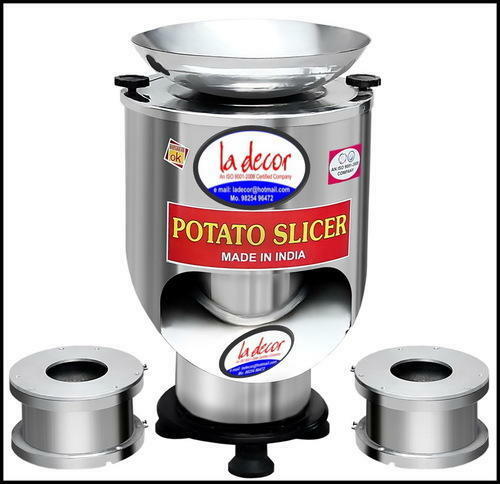 We are counted among the reputed business entities, engaged in manufacturing and supplying a qualitative range of Potato Slicer Machine. The provided machine is precisely manufactured by our highly dexterous professionals using optimum grade components and ultra-modern technology. Our provided machine is profusely demanded by our esteemed clients due to its smooth functionality and easy maintenance attributes. Moreover, our esteemed clients can avail this machine at the most affordable price.